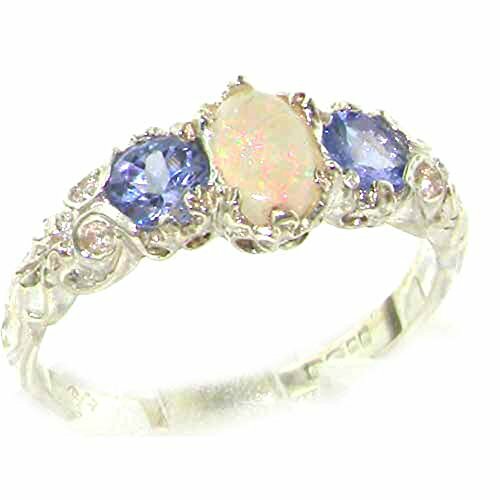 One centre oval cut 6x4 mm (0.24" x 0.16") Beautiful Colorful Opal and two Brilliant cut 4mm (0.16") Deep Blue Sapphires set in this Solid Sterling Silver Victorian style setting.The inside of the shank has a marking, this is a Full Hallmark made by the London Assay Office in England û This mark includes 925, the Leopards Head and the Royal Lion. This is your independent proof and guarantee that the ring has been completely made from Solid Sterling Silver.This is a delightful piece to wear, comfortable and easy to wear everyday, large enough to be noticed but not overpowering, . 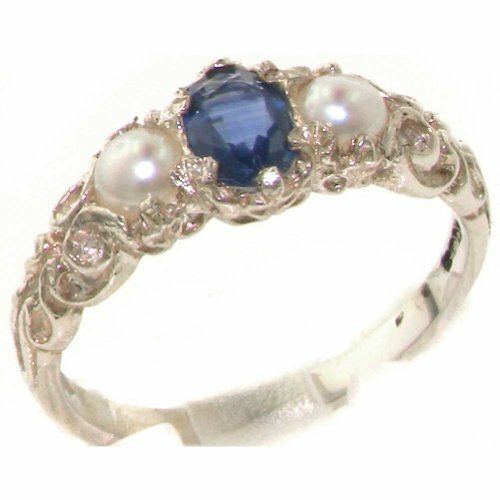 One centre oval cut 6x4 mm (0.24" x 0.16") Beautiful Blue Sapphire and two Freshwater Cultured Pearls approx 4mm (0.16") round set in this Solid Sterling Silver Victorian style setting. This is a Genuine Natural Sapphire Gemstone. This Colorful Sapphire stands out wonderfully set against the polished Silver and contrasts with the Satin sheen of the Cultured Pearls providing such an Elegant overall appearance. The ring has a good thick shank and a Highly Polished finish. This is a delightful piece to wear, comfortable and easy to wear everyday, large enough to be noticed but not overpowering.The inside of the shank has a marking, this is a Full Hallmark made by the London Assay Office in England - This mark includes 925, the Leopards Head and the Royal Lion. This is your independent proof and guarantee that the ring has been completely made from Solid Sterling Silver.This ring was Designed and Made in England, is available in a wide range of sizes and will be sent to you in a Luxury Presentation ring box. 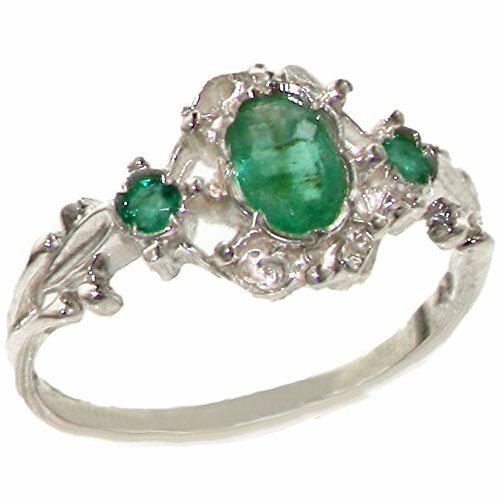 This stunning ring has been set with a large 6x4mm (0.24" x 0.16") and two 2.25mm (0.09") Vibrant Green Emeralds. The contrast of these colorful Emeralds with the Polished Silver set within this delicate yet strong setting, creates such an elegant look and feel, this ring is certainly a very special piece. 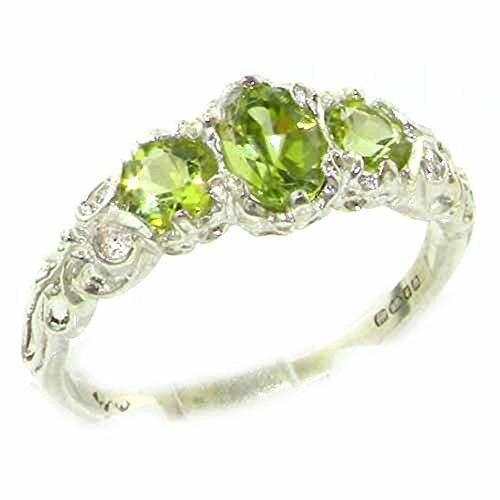 The design is such that it has a dainty appearance yet these colorful gems are just so eye-catching, therefore it is a beautiful ring to wear, comfortable, noticeable yet not overpowering.These are all Genuine Natural Emeralds hand set into Solid Sterling Silver. On the inside of the shank there is a Full British Hallmark which includes 925, the Leopards head and the Royal Lion, only High Quality Solid Silver will have a Full marking such as this.This ring was Designed and Made in England, is available in a wide range of sizes and will be sent to you in a Luxury Presentation ring box. 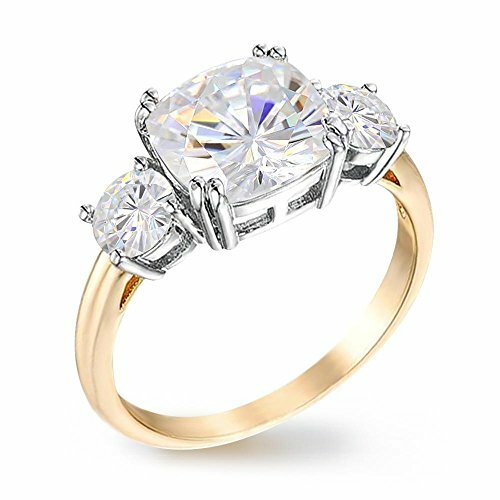 Inspired by Meghan Markle's royal wedding, this stunning two tone trilogy wedding ring embodies classic elegance with a regal flair. Brilliant round cut side stones accompany a prominent cushion cut center stone in silvertone prong setting. The band glows with a warm golden radiance, giving this ring an aura of sophistication and royalty. One centre oval cut 6x4 mm (0.24" x 0.16") Beautiful Colorful Opal and two Brilliant cut 4mm (0.16") Vibrant Tanzanites set in this Solid Sterling Silver Victorian style setting.The inside of the shank has a marking, this is a Full Hallmark made by the London Assay Office in England û This mark includes 925, the Leopards Head and the Royal Lion. This is your independent proof and guarantee that the ring has been completely made from Solid Sterling Silver.This is a delightful piece to wear, comfortable and easy to wear everyday, large enough to be noticed but not overpowering, . This Spectacular ring has been set with a Large 9x7mm (0.36"x0.28") oval cut Natural Vibrant Red Ruby Gemstone, complimented with 2 smaller matching Rubies. These gemstones have been hand set in this luxury Solid Sterling Silver swirl style setting. Certainly rare to find such High Quality valuable Rubies set in Silver. The Quality of this piece is Superb, the Gemstones have been securely claw set by a Master Jeweller, follow the ring round and you have good solid thick shank which indicates a quality design. These are Genuine Natural Ruby weighing approx 2.86ct. Completely Solid Sterling Silver - on the inside of the shank there is a Full British Hallmark which includes 925, the Leopards head and the Royal Lion, only High Quality Silver will have a Full marking such as this. 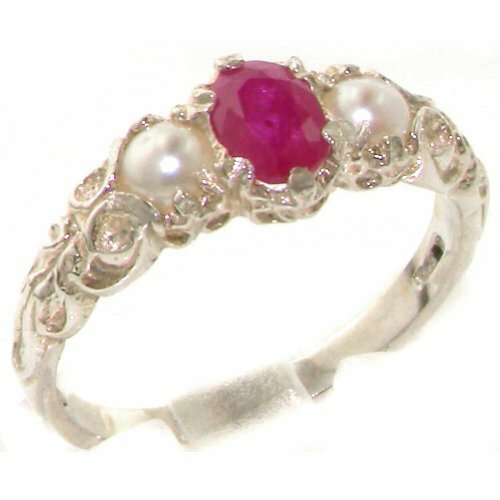 One centre oval cut 6x4 mm (0.24" x 0.16") Beautiful Red Ruby and two Freshwater Cultured Pearls approx 4mm (0.16") round set in this Solid Sterling Silver Victorian style setting. 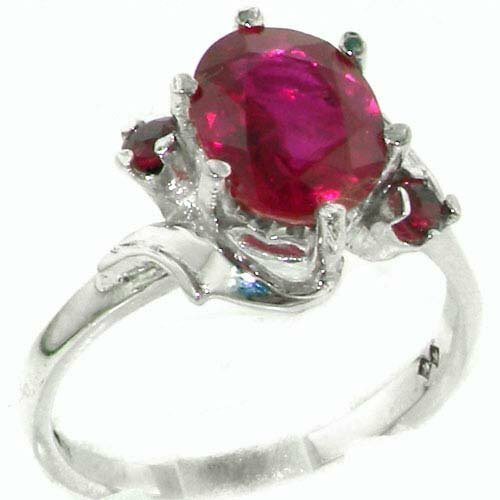 This is a Genuine Natural Ruby Gemstone. This Colorful Ruby stands out wonderfully set against the polished Silver and contrasts with the Satin sheen of the Cultured Pearls providing such an Elegant overall appearance. The ring has a good thick shank and a Highly Polished finish. This is a delightful piece to wear, comfortable and easy to wear everyday, large enough to be noticed but not overpowering.The inside of the shank has a marking, this is a Full Hallmark made by the London Assay Office in England - This mark includes 925, the Leopards Head and the Royal Lion. This is your independent proof and guarantee that the ring has been completely made from Solid Sterling Silver.This ring was Designed and Made in England, is available in a wide range of sizes and will be sent to you in a Luxury Presentation ring box. 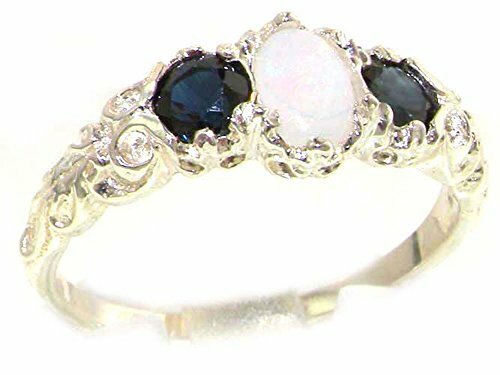 This stunning Eternity Anniversary ring has been set with one center 3.75mm (0.15" inches) Opal and two 3mm (0.12" inches) Pink Tourmalines in an adorable Solid Sterling Silver setting. 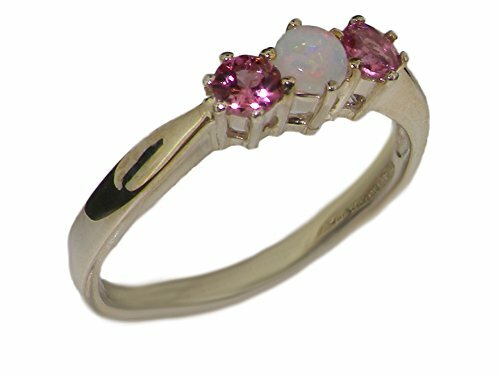 These are Natural gemstones, the Pink Tourmaline has a feminine Pink color and the Opal has a variety of rainbow colors, which makes it a very desirable combination of gems. This compliments beautifully the highly polished Sterling Silver. The Quality of this piece is Superb, the Sapphires have been specifically selected for this ring and hand set by a Master Jeweler. Completely Solid English Sterling Silver - on the inside of the shank there is a Full British Hallmark which includes 925, the Leopards head and the Royal Crown. This stunning ring has been set with a 6x4mm (0.24" x 0.16") Aquamarine and two Sapphires on the shoulders measuring 2.25mm (0.09"). The contrast of the Sparkling Ice Blue Aquamarine with these Vibrant Blue Sapphires set within this delicate yet strong setting, creates such an elegant look and feel, this ring is certainly a very special piece. 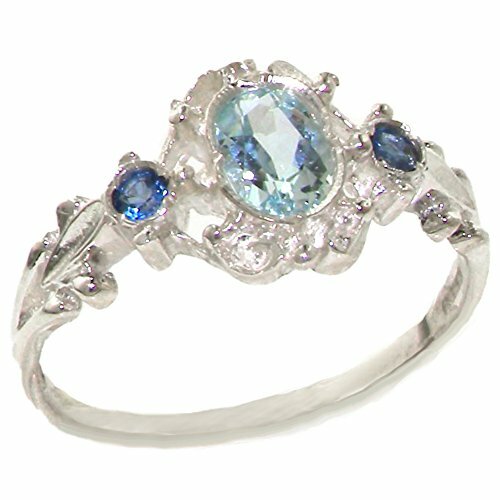 The design is such that it has a dainty appearance yet this unusual partnership of eye-catching gemstones is very attractive, therefore it is a beautiful ring to wear, comfortable, noticeable yet not overpowering.These are all Genuine Gemstones, Natural Aquamarines and Sapphires hand set into Solid Sterling Silver. On the inside of the shank there is a Full British Hallmark which includes 925, the Leopards head and the Royal Lion.This ring was Designed and Made in England, is available in a wide range of sizes and will be sent to you in a Deluxe Presentation ring box. Copyright © Wholesalion.com 2019 - The Best Prices On Trilogy Ring Online.